Maame Biney of Reston, Virginia, is known for her infectious smile — but she could soon be known as the Katie Ledecky of the Winter Olympics. Editor’s Note: This is the first story in a four-part series highlighting local athletes who will represent Team USA in the 2018 Winter Olympics in Pyeongchang. Stay tuned for more stories throughout the week. WASHINGTON — Maame Biney is changing nearly everything about USA speedskating. With her trademark braids and wide, infectious smile, Biney promises to steal headlines and camera time at the 2018 Winter Games. 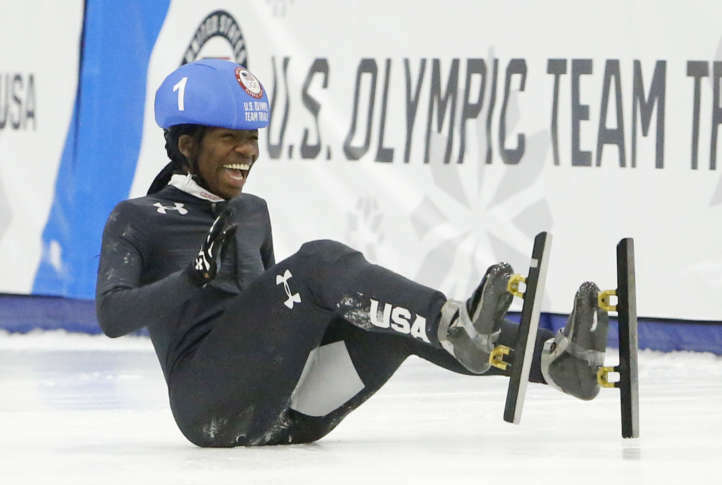 Her enthusiasm for the sport helped catapult her to victory in the women’s 500-meter at the U.S. Olympic Team Trials, earning her the title of the first black woman to make the U.S. short-track speedskating team and the second African-born athlete to represent the U.S. in the Winter Games. Biney was born in Accra, Ghana. On a visit to the states when she was 5 years old, her father Kweku made the difficult choice to keep her with him while her mother remained in Ghana. Though Biney is an exceptional athlete now, that innate ability wasn’t obvious in her from the start. Kweku pointed out a sign outside SkateQuest in Reston, Virginia, offering the chance for youngsters to learn how to skate. That led to his daughter signing up for the “Learn To Skate” program started by former Olympic speedskater Nathaniel Mills, who still remembers seeing a young Maame trying to keep her legs under her at Fort Dupont Ice Arena in Southeast D.C.
Biney’s ever-present smile certainly indicated she was enjoying life on the ice. As she got better and faster at skating, it became apparent she was better suited to speedskating than figure skating. Biney developed a competitive thirst for the former at Dominion Speedskating Club, where she honed her skills under the expert tutelage for which the D.C. area has become known. Biney graduated from local and regional competitions to the Short Track Junior World Championships Team in 2015-16, but didn’t make it out of the opening heats. The following year, she took bronze in the 500-meter race before her historic victory in the Olympic team trials in December. Thomas Hong, who competed with and against Biney at Rockville-based Potomac Speedskating Club, is joining Biney on the eight-person, short-track speedskating team and still can’t believe how much history they’re making together. “We never really considered the fact that she’d be the first black (female) speedskater to ever make the team. It’s kind of nice to know that someone I’m close to is writing history, and I’m excited to be her teammate,” he added. Biney just turned 18 years old, making her the youngest member of the short-track speedskating team. Much like gold medal swimmer Katie Ledecky, Biney has the elite skill set to medal in her first Olympic Games. But Biney’s exuberance figures to make her an immediate media darling, and possibly the face of the Winter Olympics in the U.S.
“Maame grew into this amazing athlete … she has physical gifts now, especially in the sprinting areas that set her apart from other speedskaters,” Mills said. Maame Biney will compete in the 1500-meter and 500-meter races on Monday, Feb. 12 and Sunday, Feb. 18.